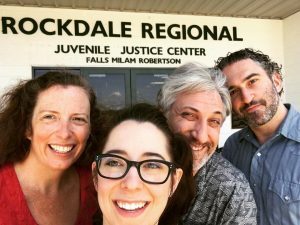 The picture here is from when Hideout Kids went to do a show for the kids incarcerated at Rockdale Juvenile Justice Center. After looking the place over and meeting the kids it became obvious to me (Jessica) that they would benefit from improv classes. I recently had a meeting with the head administrator there and we discussed all the ways that improv could help these kids develop and grow. We talked about the fact that most of these kids live on the streets and have more or less raise themselves and how improv would help them develop the much needed social skills that they missed. We talked about how many of these kids feel their mistakes make them a bad person. Improv teaches that mistakes are something you accept and grow from and that you have to move on. We felt this would be a great help in the kids struggling to accept who they are. We talked about how these kids are still kids and they still need to play and have fun if they are to grow into healthy adults. Ultimately it seems obvious that improv classes will be a significant help for this facility. They are able to cover some of the costs, and the Hideout is donating some of the costs, but the remaining difference between what is covered and what we need to pay the teachers to drive out there is $230 a month. We will try this one time to see if it works, and then if it does we’d love to do it for a monthly basis through June. Please help if you can. Your one time or ongoing donations will make a big difference in the lives of some needy kids. If you need to have this be tax deductible or if you can get matching grants through your work, please email me Jessica@hideouttheater.com and I will tell you about how we can route your donation through Austin Creative Alliance.